The superhero genre — as we know it — was first birthed over seven decades ago in the pulpy pages of the 10-cent comic books. Mint copies of which that are now worth thousands, if not millions, of dollars. Not only are the books themselves more valuable, many of those original heroes are even more popular today than they were at their inception. Even the heroes who weren’t popular then have been resurrected to much critical acclaim today. We call this period of superhero storytelling “the Golden Age” of comics, but we are currently living in a new golden age of superhero storytelling, except the heroes have migrated from the four-color page to the fourteen-screen multiplex. The fact that we can count on a new comic book superhero movie (or three) every year until infinity and beyond is both a blessing and a curse for the nerd contingent. For every billion-dollar grossing blockbuster that stars men in tights saving the universe — and it is almost always men — there are critics from both within and without nerdom that bemoan the genre’s grasp on pop culture and predict its demise every year. “Superhero fatigue,” it’s called. Birdman or (The Unexpected Virtue of Ignorance) is the latest film from writer/director Alejandro González Iñárritu — best known for heavier, more melodramatic fare like Babel and 21 Grams — and it takes on the superhero genre, and the fatigue that may or may not come along with it, like no other film before it. 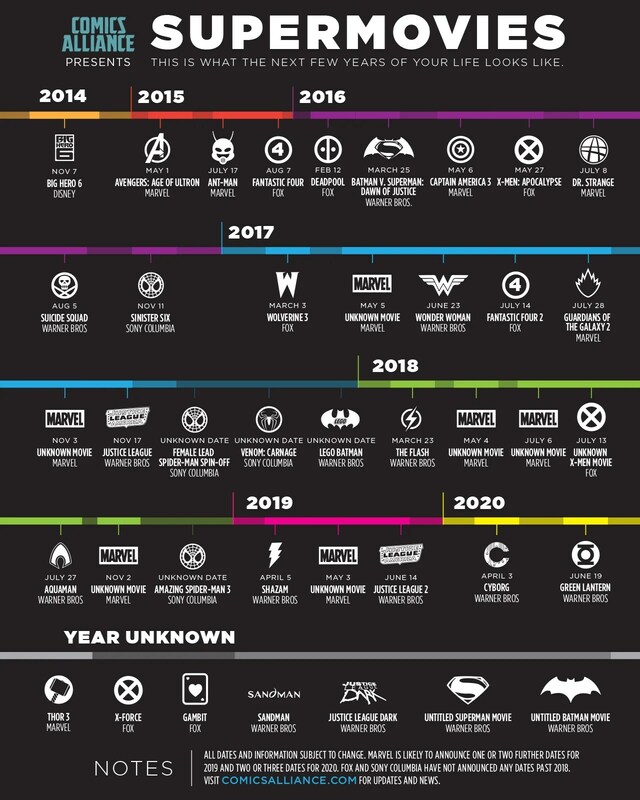 Big ups to ComicsAlliance for this awesome infographic of all the superhero movies that will be dominating your life for the next decade or so. Birdman is both a critique and a celebration of the superhero movie. It is about what superhero movies mean to our culture as much as it is about what those movies have done to our culture. And while many critics keep pointing to a quote by Iñárritu saying he thinks superheroes represent the “cultural genocide” of cinema, the movie itself actually draws a different, less hyperbolic critique of the genre in the context of the age-old tension between art and commerce1. Yes, Birdman is about all of these things. But first, let me tell you what it’s about. Though he is eager to shed his superhero past, he cannot escape the Birdman, who manifests himself as a raspy voice in his subconscious (and occasionally as a fully-fleshed figure only Riggan can see). Throughout the film, Thompson also demonstrates some of the superpowers that he, presumably, shares with his onscreen doppelganger. Whether his super abilities are actually occurring, or a figment of his increasingly unhinged psyche, is left for the viewer to decide but definitely lends an aura of magic realism to the proceedings. The film is also a technical marvel. Seemingly shot in one, continuous, two-hour take — though there are a few obvious transitions — Birdman instantly immerses the viewer into the labyrinthine corridors of a Broadway theater (as well as inside Riggan’s mind). Many articles have already been written about Emmaneuel Lubezki’s gorgeous camera work, Antonio Sanchez’s innovative jazz drum score, and the insane amount of choreography and rehearsal that was required to pull off filming such long, difficult takes in only 30 days. The hype around Birdman has been as much about the craft of making it as it has been about the subject it’s deconstructing. And deservedly so. The movie, ostensibly — and quite literally, is about the “play within a play” and is very self-aware about this fact. That’s the other thing, Birdman is the most meta movie out in theaters right now. It’s no coincidence this film is being released in the same year Tim Burton’s Batman — also starring Keaton as the titular hero — is celebrating its 25th anniversary. No other actor could bring the right kind of baggage and context to the character of Riggan Thompson. Like his cinematic counterpoint, Keaton walked away from a career defining turn as an iconic superhero two decades ago only to reemerge in 2014 with the most critically acclaimed role he’s ever played. It’s also no wonder that the movie is being released smack dab in the middle of Oscar season since Keaton’s bravura performance is bound to be acknowledged by the Academy (and hopefully, I’ll finally get to add Keaton’s name to this list). 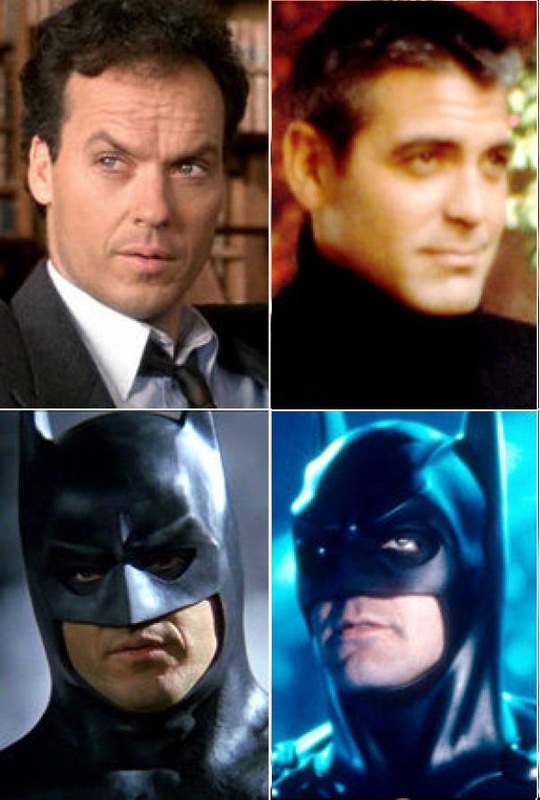 Though I doubt Michael Keaton has ever had internal dialogues with his own inner Bat demons, it’s nonetheless interesting to consider what the superhero movie boon means to him as an actor. Keaton was one of the fore bearers of the superhero renaissance we are currently enjoying, after all. When he bowed out of Batman Forever in 1995, few could have imagined what was just around the corner. Blade debuted just three years later in 1998 while X-Men came in 2000. Those two Marvel-based films ushered in the current era of box office dominance that has not since relented. Interestingly, Keaton as Thompson isn’t the only meta-commentary on the state of the superhero movie industry. Because the film is set in our world, its pop cultural references also reflect life in 2014 — though, I wonder if the references to twitter and YouTube will instantly date this film, great as it is, when future generations watch it in their holodecks? That point aside, those references are absolutely necessary for the story the movie’s trying to tell. When Riggan needs to find a new lead for his play after an unfortunate freak accident (or was it?) on stage, the potential replacement actors that get bandied about are all unavailable because they have their own billion-dollar franchises to tend to: Woody Harrelson (The Hunger Games), Michael Fassbender (X-Men), and Jeremy Renner (Avengers). References to Robert Downey Jr. and his billion-dollar Iron Man franchise is a running gag throughout the film as well. There’s also a brief cameo by Superman himself, believe it or not. During the movie’s triumphant climax, Riggan fully embraces his Birdman persona, ascends to the rooftops of New York City, and takes flight. But in the background of this entire scene? A billboard for Man of Steel. You can’t not see it. The most poignant of these allusions, though, comes when Riggan is telling a story to his daughter Sam (played by Emma Stone, also a superhero movie alum after her turn in the Amazing Spider-Man films) about a time he was on the same turbulent flight as George Clooney. Riggan’s anxiety wasn’t about dying in a plane accident; instead, he was more consumed with the fact that if he had, the headlines would have been all about George Clooney. This is significant because while Clooney is widely regarded as the worst Batman, he has arguably had the most successful post-Batman career. Keaton, on the other hand, has never quite achieved his pre-1989 status as a movie star. Sure, the scene in question makes no reference to Clooney’s time in Batman & Robin, but the subtext is all there. 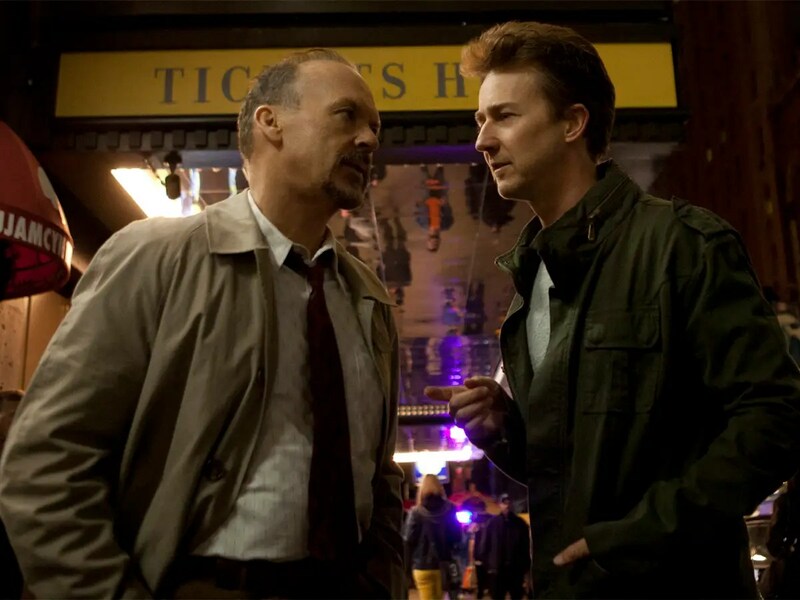 The movie also dips into meta commentary by casting Edward Norton as Michael Shiner, the veteran theater actor that is brought in to play opposite Riggan on stage. The scenes between these two actors simmer and sizzle each time they share a scene together and their performances elevate every frame of the movie. Shiner’s presence in the production is disruptive to say the least. Though he is difficult to work with, Riggan is resigned to keep him on because his involvement all but guarantees press coverage and ticket sales, all things Riggan requires on his journey toward artistic integrity. And as each rehearsal and preview performance wears on, it’s clear that Riggan and Mike do not see eye to eye on anything, including drinking real gin and having real boners on stage. This clash of egos comes to a head when Mike takes the credit for Riggan’s passion project and swipes the spotlight right from under him (which is Riggan’s Clooney anxiety made real). So why is Norton as Shiner so meta? Well, for starters, Norton is also a superhero movie castoff. In 2008, he starred in Marvel Studios’ rebooted The Incredible Hulk and was supposed to be part of the Marvel Cinematic Universe alongside Downey, Chris Evans, and the rest of the Avengers. The problem is Hulk earned pretty much the same box office as its predecessor and though Norton wrested some creative control over the movie, he was unable to parlay that into the type of deal that Downey is still reaping the rewards from. Norton was also, allegedly, very difficult to work with on set and had a pretty public — and nasty — falling out with Marvel’s head honcho Kevin Feige. That’s why Mark Ruffalo was the Hulk in 2012’s The Avengers. Just as Keaton’s casting as Riggan Thompson harkens back to his Batman days, I can’t help but think it was intentional to have Norton play upon his Incredible Hulk reputation, or at the very least leave it there for the audience to decode. Ultimately, I don’t think Iñárritu is really making a definitive statement either way about what superhero movies mean for our culture, nor is he taking issue with the people tasked with presenting those films to us. If anything, this is Iñárritu’s response to his Mexican Cha Cha Cha compatriots Alfonso Cuarón (Harry Potter and the Prisoner of Azkaban) and Guillermo del Toro (Pacific Rim) — fellow auteurs who have successfully balanced art house and fanboy cred. Rather than dive into the fantastical worlds of wizards and giant robots, though, Iñárritu has turned genre film inside out and laid bare the true soul of the superhero. My review of Birdman is over at The Nerds of Color. Interesting perspective on the movie.